Sometimes you go to a show just hoping the opening act won’t be unbearable. Then sometimes you get something like Shouting Thomas Torment. While sometimes situated in a group, Shouting Thomas and the Torments, Shouting Thomas was doing it one-man band style at the Beachland Tavern Saturday night. He immediately lived up to his name by shouting, showman style, from the moment he stepped on stage to the moment he stepped off. In between, he thumped the bass drum, drove the hi-hat and took the guitar from fuzzed-out punk blues to rockabilly twang, shook it all together and broke it all down. The set kicked off with “Struggle (Scratch That Itch)”, hit on a number of highlights like “Slave for My Cave”, “All Grown Up Wrong”, “Trouble Doll” and “Swamp Witch”, and closed out with “Shakey Shake #1”. There was also a Bo Diddley beat and a very respectable imitation of a chicken on the guitar. I went in not knowing a single thing about Shouting Thomas Torment and came out an enthusiastic fan. One of my regrets from the Great Mississippi Sojourn I took last summer with co-blogger Jennifer and our friend Cam Rogers is that I didn’t spend an evening or two in a juke joint. Well, now I feel a little better because James “T-Model” Ford brought the juke to the Beachland. Aside from being about the right size and aesthetic for a Mississippi juke, the tavern also had about the right heat and humidity Saturday night. But it took T-Model to fill it with the right vibe and sound. GravelRoad – this night being comprised of just guitarist Stefan Zillioux and drummer Martin Reinsel as bass player Jon “Kirby” Newman was under house arrest for undisclosed reasons – took the lead, playing a couple of their own numbers, showing why they make a great complement to Ford with their low, rough, electric blues-drag sound. Then Ford, who drew a crowd that covered a wide variety of ages and classes, took the stage, strapped on Black Mattie (his trusty Peavey guitar) and got hips to rolling in short order. While Ford was undeniably the star of the show, the support of GravelRoad should not be underestimated. 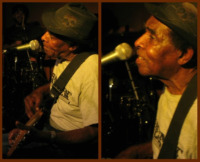 Zillioux stayed tight in Ford’s wake through tunes like “I Love You, Baby”, “Hip Shakin’ Woman”, “Chickenhead Man” and “Train I Ride”, while Reinsel pummeled a tide of heavy beats that were more than a little responsible for the shaking of hips through the night. Not to mention, Reinsel looked like he was having the time of his life. Video courtesy of Chris Bishop. For some absolutely beautiful shots of T-Model Ford’s recent show in St. Louis, Missouri, check out our friend Nate Burrell’s Flickr set. Reposted fromNow This Sound Is Brave.